It was Australia day and I knew I was baking lamb that day. Now to serve with the lamb I knew I wanted some sort of baked potatoes, I was thinking my potatoes anna or a potato gratin would be nice, but then I remembered a Facebook video I saw a few weeks ago of individual potato stacks and I knew I wanted to try it. I can't remember who posted the video so I can't acknowledge them, sorry about that, as I do like to give credit where credit is due. Now as I was having a rather relaxing Australia Day, I didn't feel like making one type of potato so I tried making the stacks three ways. So this recipe is for the potato stack on the left. 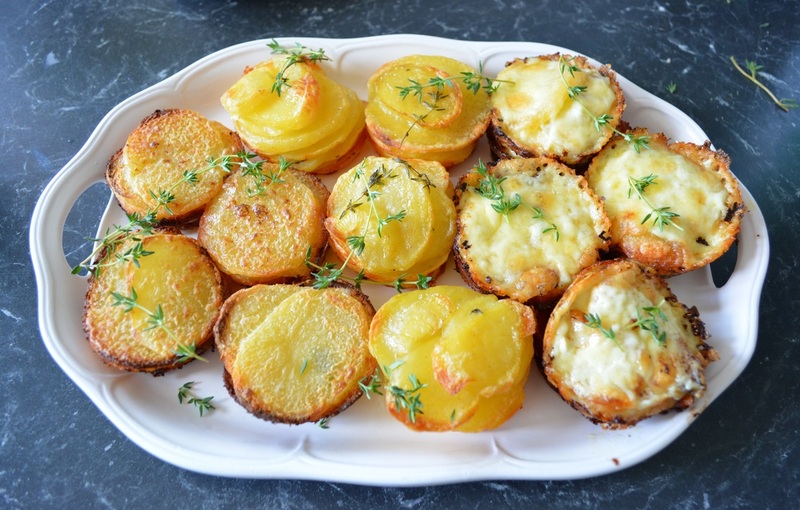 These were delicious, it is probably the best way to bake potatoes. You get individual portions, they are simple to make and they look amazing. Now you do need to slice the potatoes thinly, I used a knife as I didn't feel like washing my mandolin (remember I was having a relaxing day), but a mandolin would make the slices thinner and the thinner the slices the faster it cooks. But feel free to use a knife, just take the time to slice the potatoes as thin as possible. Also with the potatoes, try and get potatoes that have a width the size of your muffin tin, so that when you slice them, they will fit inside of your muffin tin, without you having to cut them. If you do need to cut them, do so, as you can't tell once baked, but it is easier if you don't have to. Also this is a recipe where the recipe is a guide really. You can make more or less of them, without worrying about measuring anything, as basically the recipe is, you fill up a muffin hole with potato slices and add a tablespoon of cream to each stack. 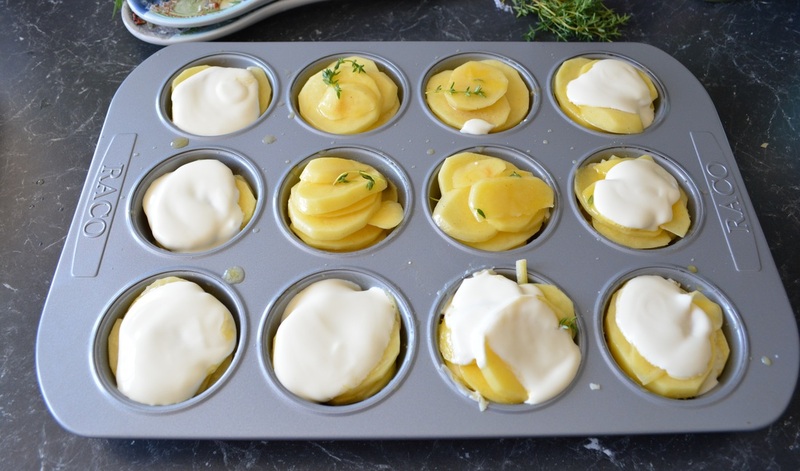 So, if you are looking at a tasty new way to serve baked potatoes, you do need to try this, it is so easy to make and they not only look great, they taste great to. Lightly grease your muffin cups with the softened butter (if you have forgotten to allow time for the butter to soften, you can melt it also, then brush on the butter). Thinly slice the potatoes. Place 2 slices of potatoes into your muffin cup, season lightly with salt and pepper, add on another 2 slices, then season lightly with salt and pepper, continue doing this with all your potatoes until your muffin cups are filled. If using thyme, add a small amount on top of each stack. Pour 1 tablespoon of the cream over each potato stack. Place a sheet of baking paper over the potato stacks. Then cover the muffin tray with foil. Bake for 35 minutes. Remove the foil and baking paper and continue baking until golden, and the potatoes are soft, about another 10-15 minutes. Allow to cool for 3-5 minutes in the tin. To remove them from the muffin tins, use a thin knife and run it carefully around the stack, take care not to scratch your tin. Now using an icing spatula or a dinner knife carefully remove the stacks from the tin, they should come out easily. Serve immediately with roast lamb, beef, chicken or fish, it goes with them all and a lovely green salad on the side.